Have you ever been nervous to give a presentation or manage a meeting? You’re not alone. Seamless presentations take a lot of preparation. Not only do you have to engage your audience, but you also have to be prepared for trick questions and make sure your team sticks to the agenda. Luckily, there are tools to help you master the art of presenting and leading a group. From visual tips to answering trick questions, this week’s featured courses can help you practice many helpful skills for effective management. 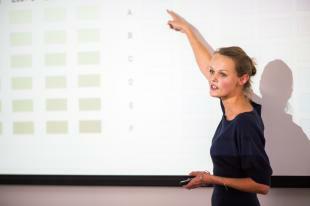 Your host, Kelly Vandever, helps you master effective PowerPoint presentations. You will learn the basics of PowerPoint, as well as special tips and techniques for “powering up your PowerPoint.” Vandever introduces helpful hints including what not to do and why. She explains how you can incorporate research into your presentation to improve your powerpoint slides. This 3-hour course from Bigger Brains includes helpful videos that cover how to improve retention, how to incorporate emotion, the significance of using images, and the ideal way for using images in presentations. Master PowerPoint with this course so you can take full advantage of the software. Presenters must identify and manage their audience’s reactions, especially when listeners misunderstand or disagree. Such miscommunications may be hard to anticipate. This course outlines tools to help presenters react positively to trick questions during a presentation. It overviews three golden rules for managing awkward situations including understanding what people want to hear and how to deal with awkward situations when they arise. This 30-minute course from Cegos includes audio narration, inline quizzes, video, and games to help you master effective communication. Managing meetings effectively and productively takes a certain amount of skill. This 3-hour course from The Development Company LTD provides a practical approach to management through four interactive modules. Topics include the meeting cycle, key skills of a chair, calculating costs, the Bion Model, and developing an agenda. The course includes a full set of downloadable handouts and other helpful tips. Take this course to master managing a meeting effectively and meeting your objectives. Whether developing beautiful, interactive visuals for your presentation or organizing a team during a meeting and maintaining focus, these featured courses can help you achieve your goals.